Chongqing (Simplified Chinese: 重庆; Traditional Chinese: 重慶; pinyin: Chóngqìng; Postal map spelling: Chungking; Wade-Giles: Ch'ung-ch'ing) is the largest and most populous of the People's Republic of China's four provincial-level municipalities. It is also the only four provincial-level municipality in the less densely-populated western half of China. Before March 14, 1997, Chongqing was a provincial city within Sichuan Province. Located on the edge of the Yungui Plateau, Chongqing is intersected by the Jialing River and the upper reaches of the Yangtze. It contains Daba Shan in the north, Wu Shan in the east, Wuling Shan in the southeast, and Dalou Mountain to the south. The city is very hilly and is the only major metropolitan area in China without a significant numbers of bicycles. Human activities are dated back to the last part of the Old Stone Age (about 20,000 to 30,000 years ago). Chongqing is home to Asia's largest aluminum plant, South West Aluminium. The city is also the biggest inland river port in western China. Chongqing (Simplified Chinese: 重庆; Traditional Chinese: 重慶; pinyin: Chóngqìng; Postal map spelling: Chungking; Wade-Giles: Ch'ung-ch'ing) is the largest and most populous of the People's Republic of China's four provincial-level municipalities. It is also the only four provincial-level municipality in the less densely populated western half of China. According to the 2005 census, just over 6.3 million people live in Chongqing. Chongqing has an area of 50,952 square miles (82,400 km²) and can be divided into 40 subdivisions. The name Chongquing is derived from the old name of a part of the Jialing River that runs through the city and feeds into the Yangtze River However, until 800 years ago, Chongqing went through several names: Jiangzhou, Yuzhou and Gongzhou, in that order. Human activities are dated back to the last part of the Old Stone Age (about 20,000 to 30,000 years ago). The Zhou dynasty was replaced by the Shang Dynasty in the eleventh century B.C.E.. The Ba people established the State of Ba, making present-day Chongqing the capital. By 316 B.C.E., however, it had been overrun by the State of Qin (Quin). The State of Qin divided China into 36 prefectures, replacing the State of Ba with the Ba Prefecture (Jiangzhou). At its height, the State of Ba covered a great area: it included present-day eastern Sichuan province, southern Shaanxi province, western Hubei province, northwestern Hunan province, and northern Guizhou province, with its administrative center at the pre-1997 Chongqing. During a majority of the Qin and Han Dynasties, this area remained one unified administrative area, with its administrative center at the pre-1997 Chongqing. Chongqing was subsequently renamed in 581 C.E. (Sui Dynasty) and 1102, to Yu Prefecture and then Gong Prefecture. In the Southern Song Dynasty (1127-1179), the city’s name was changed to Chongqing Fu, meaning ‘double celebration,’ to mark the princedom and enthronement of Emperor Zhaodun (a native of the city) in 1189. Lack of administrative skills by the emperors, bureaucratic divisions within the court, oppositions between Mongol generals, and unsuccessful supervision of provincial and local administration led to the weakening of the Yuan government by the 1340s. In 1351, catastrophic flooding of the Huang and Huai river basins provoked hundreds of thousands of long-oppressed Chinese peasants into open rebellion. In 1362, Ming Yuzhen, a general of the rebel Han regime and a peasant rebel leader, established the Daxia Kingdom (Xia) at Chongqing. 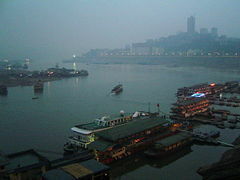 Chongqing had always been an essential port, performing as the collection point for the abundant produce of the region. Under the Qifu Agreement of 1890, Chongqing opened to foreign trade.It was the first inland commerce port opened to foreigners. In 1929, Chongqing became a municipality of the Republic of China. During the Second Chinese-Japanese War (1937-1945), the Nationalist Guomindang government of China moved the capital from Nanjing to Chongqing. Chongqing’s infamous foggy weather conditions probably saved the city from complete devastation because the Japanese bombers were only able to fly on clear days. In 1954, the municipality was reduced to a provincial city within the Sichuan Province of the People's Republic of China. 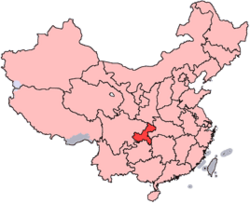 On March 14, 1997, the Eighth National People's Congress decided to merge the city with the neighboring Fuling, Wanxian, and Qianjiang prefecture-level districts that it had governed on behalf of the province since September 1996. The resulting single division was the Chongqing Municipality, containing 30,020,000 people in forty-three former counties (without intermediate political levels). The municipality became the spearhead of China's effort to develop its western regions and coordinate the resettlement of refugees from the Three Gorges Dam project. Its first official ceremony took place on June 18, 1997. People's Liberation Monument (World War II victory monument). 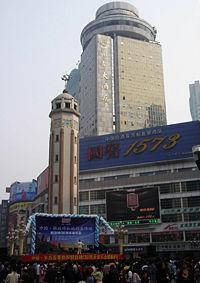 Commercial high-rise buildings around the People's Liberation Monument. The confluence of the Jialing River and Yangtze River, as seen from Chongqing. The city is very hilly and is the only major metropolitan area in China without a significant numbers of bicycles. Historically, Chongqing has been a major trading inland port, transporting goods from the southwestern provinces to eastern China. During the Sino-Japanese War (1937-1945), Chongqing was transformed into a heavy industrial city, with a large military industry that continued to thrive for decades after 1949. Since the 1980s, many of these military industry enterprises have undergone reforms and turned from producing military goods to mostly civilian products for survival and growth. Chongqing is rich in natural resources, with more than forty kinds of minerals. Its coal reserves are estimated to be 5,291,094,292 tons (4.8 billion metric tons). The Chuandong Natural Gas Field in Chongqing is China's largest inland production base of natural gas, with deposits of 270 billion m³, accounting for more than one-fifth of China's total. 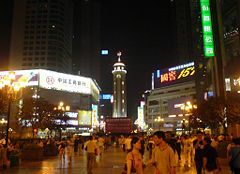 Chongqing contains China’s largest reserve of strontium, and China has the second largest reserve of the mineral in the world. Chongqing is home to Asia's largest aluminum plant, South West Aluminium, which rolled out 234,792 tons (213,000 metric tons) of finished products in 2004 for companies engaged in building materials, printing, electrical appliances, aerospace, packaging, and vehicle production. Manganese mining is the most important industry in the Xiushan area, but has been criticized for wasting resources, ruining the local environment and causing industrial accidents. A survey in 2005 by China’s State Environmental Protection Administration (SEPA) found 13 firms in the manganese triangle had breached targets on the release of hexavalent chromium and ammonia-nitrogen – in the worst case, by a factor of 180. The clean-up ordered by SEPA resulted in firms closing and the expenditure of 280 million yuan ($37.3044 million USD). Chongqing's agricultural sector still employs a significant portion of the population. Other than rice, fruits, especially oranges, are important sources of income for the farmers. In the past 25 years, surplus labor has forced huge numbers of farmers to migrate to the relatively more developed industrial centers of southern and eastern China for employment opportunities, thus making Chongqing one of the biggest labor export areas in China. Close-up view of the People's Liberation Monument. The central government has recently embarked on an economic policy aimed at developing western China: the China Western Development strategy. As part of this new plan, the central government has invested heavily in Chongqing's infrastructure and has made a plan for Chongqing to become the "Gateway to the West." Located at the head of the reservoir behind the Three Gorges Dam, Chongqing is planned as the beachhead for the development of the western part of the country. With the completion of the Three Gorges project, its reservoir will bring oceangoing ships to the harbors of Chongqing. The hope is that this gritty fogbound megalopolis may become a Chinese Chicago, opening up the interior, shifting the country's center of gravity west, and kick-starting the economy – as Chicago did for the United States in the nineteenth century. Massive public works are currently under way in the city, including overhead and surface commuter rail lines connecting the many districts of the city. Foreign investment in the city is growing at a fast pace. 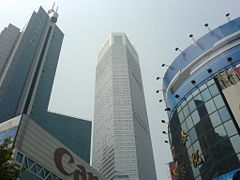 Chongqing is enlarging its commercial sector. New development zones such as the Chongqing New North Zone (CNNZ), located north of the downtown district, have been established to form Chongqing's modern twenty-first century industrial base. In 2005, the nominal GDP of Chongqing municipality was 310 billion yuan ($38.75 billion USD), a rise of 11.5% year-on-year. Its per capita GDP was 11,068 yuan ($1,383 USD). The primary, secondary, and tertiary industries of Chongqing were worth 46.342 billion yuan ($5.8 billion USD), 125.832 billion yuan ($15.7 billion USD), and 134.736 billion yuan ($16.8 billion USD), respectively. Chongqing is the biggest inland river port in western China. Historically, most of its transportation, especially to eastern China, was through the Yangtze River. Also, Chongqing Jiangbei International Airport, located north of Chongqing provides links to most parts of China and to other countries and regions such as Hong Kong, Japan, Korea, and Thailand. Currently, the transportation system in the metropolitan area is being upgraded to modern standards. With the Yangtze and Jialing rivers running through Chongqing, and a hilly geography, ground transportation in the city requires an unusual number of bridges and tunnels. Since these structures necessitate large amounts of money, much of the public transportation in the city is vulnerable to lapses in safety. This may also be a result of little standardization and semi-privatization of the many transportation systems. However, the highway network around the city and the nearby satellite towns is almost completed. One unique form of transportation in the city is the cable cars which are suspended over the rivers. Recently, the Chongqing Metro was completed and entered service in January 2005. Magnolia street lights in Chongqing. The climate is semi-tropical, with the two-season monsoonal variations typical of South Asia. It has hot summers, and the temperature can be as high as (109°F 43°C). Along with Wuhan and Nanjing, it is known as one of the "three furnaces" of China. In the winter, it is wet and warm. While it seldom snows, most days are foggy. The typically severe fogs provided protection during World War II as the city was periodically bombarded by Japanese aircraft; their air crews were unable to target their bombs accurately. The prevalent black tile roofs of buildings also tended to blend into the ground colors and so became an effective form of camouflage. As is true of most of China, the city often experiences severe air pollution, largely as a result of the burning of coal without pollution controls. Coal is burned both for industrial processes and for the production of electric power. The surrounding mountains prevent wind from moving the air pollution, causing smog to settle over the city, making air quality even worse. Chongqing and the surrounding areas are full of places for tourists to visit. The most famous is the Three Gorges, a scenic area along Yangtze River. The 656,168 feet (200-km) long area is the most visited canyon in China. Besides its gorgeous natural scene, it is also a culturally rich area. Another popular site is the Dazu Rock Carvings, carved in the Tang Dynasty, with mainly Buddhist themes; it now belongs to UNESCO World Heritage. Sightseeing is popular throughout the city as well. There are historic World War II sites located in the metropolitan area. Outside the city, Fishing Town marks where the Mongol prince Mongke Khan was defeated in 1243, stopping the Mongol expansion toward Europe and Africa. According to a Reuters press release, in 2005 Chinese tourism authorities started a project to build a "women’s town" in the Shuangqiao district of Chongqing municipality as a tourist attraction. The motto of Longshuihu village is "women never make mistakes, and men can never refuse women's requests." According to one official (surname Li), "Traditional women dominate and men have to be obedient in the areas of Sichuan province and Chongqing, and now we are using it as an idea to attract tourists and boost tourism." The tourism bureau is investing between 200 million yuan ($26 million USD) and 300 million yuan ($39.969 million USD) in infrastructure, roads and buildings for the 1.45 square mile (2.3 km²) village and is seeking outside investors as well. The project is expected to be completed in 2008-2010. 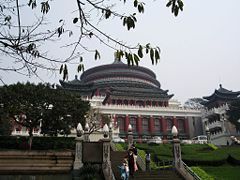 The Great Hall of the People in Chongqing. Three Gorges is a scenic spot with numerous lookouts from Qutang Gorge, Wuxia Gorge, and Xiling Gorge. Access to these gorges can be accomplished by riding on a cruise on the Yangtze River. Dazu Grottoes were built from the first year of the reign of Emperor Yonghui of the Tang Dynasty (650) to the Qing Dynasty. These Dazu Stone Carvings Grottoes mainly represent Buddhist images. There are over 50,000 statues scattered throughout 75 different places. 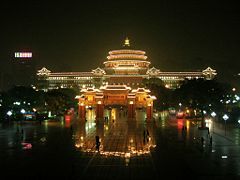 The city is home to one of the largest public assembly buildings in China, the Great Hall of the People, built in modern times but emulating traditional architectural styles. 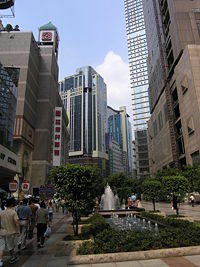 This is adjacent to the densely populated and hilly central district, with narrow streets and pedestrian only walkways. A museum at the World War II headquarters of General "Vinegar Joe" Stilwell preserves and presents materials that reflect the long and historic affection between China and the U.S., despite the global frictions between their respective governments of the late twentieth and early twenty-first centuries. A modern and well stocked zoo exhibits many national and regional animals, including the Giant Panda and the extremely rare South China Tiger. 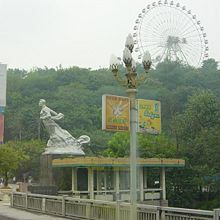 The People's Liberation Monument is located in the center of Chongqing city. It attracts many tourists, and is surrounded by numerous shopping boutiques. Red Rock Village Museum is the home of Communist Party Leaders Mao Zedong and Zhou Enlai stayed there for negotiation with Kuomintang on coalition between two parties. Chongqing is home to many Hot Springs. One can take time to relax in the varying temperatures and atmospheres these springs have to offer. In July 2007, the city opened a free public bathroom with 1,000 toilets spread out over 32,290 square feet. Some urinals are uniquely shaped, including ones inside the opened mouth of a crocodile, and several that are topped by the bust of a woman resembling the Virgin Mary. Officials submitted an application to Guinness World Records to have the four-story public bathroom listed as the world's largest. Chongqing University 重庆大学, founded in 1929. Southwest University 西南大学, founded in 1906. Yangtze Nomal University, 长江师范学院 founded in 1931. Institutions without full-time bachelor programs are not listed. ↑ Who is Zhang Dejiang? China Digital Times (March 15, 2012). Retrieved July 10, 2012. ↑ Chongqing's Mayor turns against Bo Xilai The Epoch Times (March 19, 2012). Retrieved July 10, 2012. ↑ City Flower Retrieved July 10, 2012. ↑ Chongqing China, Chong Qing Org. Retrieved October 25, 2007. ↑ Chongqing China, Chong Qing Org. ↑ History, Chongqing Municipal Government with Translations by Lan-Bridge Chongqing. Retrieved October 25, 2007. 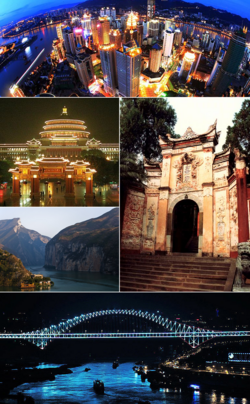 ↑ History of Chongqing, Discover Yangtze Tours. Retrieved October 25, 2007. ↑ China, Encyclopedia Britannica Online. Retrieved October 25, 2007. ↑ China's military industry enterprises come out of mountains to world market, People's Daily Online, UPDATED: 12:36, May 06, 2004. Retrieved October 25, 2007. ↑ CHONGQING MUNICIPALITY, Major Economic Indicators, Market Profiles on Chinese Cities and Provinces, Hong Kong Trade Development Council. Retrieved October 25, 2007. ↑ CHONGQING MUNICIPALITY（重慶市), The Australia-China Chamber of Commerce and Industry of New South Wales. Retrieved October 25, 2007. ↑ Nick Mackie. China's west seeks to impress investors, BBC China business reporter in Chongqing, Western China Last, BBC News, Updated: Wednesday, 4 May 2005, 20:10 GMT 21:10 UK. Retrieved October 25, 2007. ↑ Chongqing New North Zone, CNNZ Official Site. Retrieved October 25, 2007. ↑ Du Jing. Chongqing Issues Report on Economy in 2005, February 2006, Chinese Government’s Official Web Portal (GOV.cn). Retrieved October 25, 2007. ↑ 1,000 Person World’s Largest Restroom, Weird Asia News. Retrieved October 25, 2007. Chongqing China. 2005. Chongqing, People's Republic of China: The Foreign Affairs Office, Chongqing Municipal Govt. Pan, Yu-hong. 2007. Application of industrialized housing system in major cities in China a case study of Chongqing. Hong Kong: Dept. of Building and Real Estate, The Hong Kong Polytechnic University. Information about Chongqing for expats. "Invisible city" The Guardian, 15 March 2006. This page was last modified on 16 February 2017, at 23:08.